At Levelsure our professional team of engineers and designers have committed ourselves to developing a higher standard of practical tools for our customers. Fixed clip for easy set-up and 360 Degree adjustments, along with 1/4 -20 thread mounts for added versatility. IP54-water/debris resistant( very stable and not easy to be broken), it can be use at dust environment and washed. Self-leveling is quick and accurate and able to self leveling within 4° of the base. You can also switch to manual mode and turn it around on a fixed base. We included a visual warning feature. When the laser level is beyond its operating range ((4°-/+1°), a warning light will flash so you can make the adjustment before you level. Have a high cost-effective, the same quality as the as the famous brand, but a good price for amazon buyer. WARNING Emits Laser Radiation - Avoid direct exposure of the laser beam to the eyes.  USEFUL AND HANDY - With its soft-grip and light weight design, the 9011G is easy to handle and fits right in your tool belt. From home-renovation projects, such as installing laminate flooring, framing, laying out tiles or simply hanging pictures.  GREEN LASER UNIT - We adopt Osram's laser unit, made in Germany, which is the best green laser unit in the word at present from Germany Munich; Green laser is 2 times brighter than red laser with the same light source, still accurate and clear under the sun, available for outdoor using. 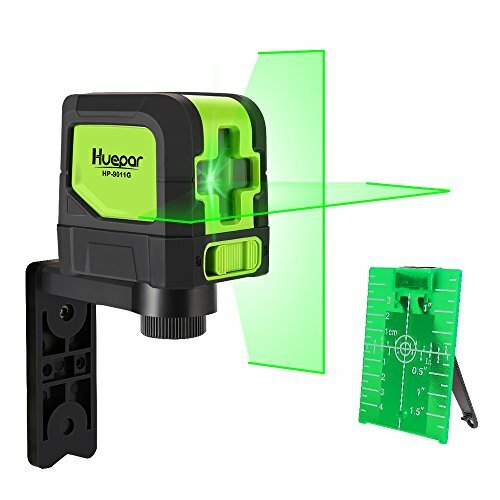  FINE POSITIONING - Projects a laser cross with an accuracy of +/- 1/9 of an inch at 100 feet and full brightness for optimal visibility; 1/4 -20 thread mounts allows you to use it with a tripod (not included) and adjust its height easily to make measuring flexible and stable.  SELF-LEVELING MODE - With the pendulum unlocked, you are able to self-level on an inclined surface within 4 degrees. If the surface inclines over 4 degrees, the laser will flash to indicate you are out-of-leveling parameters. You can be confident that you are within optimal leveling range.  MANUAL MODE - With the pendulum locked you can prevent the laser from going off plumb or level when being transported. You can turn it around on the fixed clip 360 degrees. This allows leveling lines to be projected in any position or angle. This feature is also useful for slope applications. If you have any questions about this product by Huepar, contact us by completing and submitting the form below. If you are looking for a specif part number, please include it with your message.